The Beautiful Tent Company is proud to serve the South West region and help our customers achieve the wedding of their dreams. With luxury marquee hire in Devon, Cornwall and Somerset, we work alongside you to create bespoke wedding arrangements from coast to coast and the countryside in between. Whatever your wedding theme, we will bring your perfect vision to life on your special day with our luxury marquees for hire. Come with us and explore how our wonderful white wedding marquees will make the perfect addition to your stunning South West wedding in 2019. There is no doubt about it, Devon is an absolute gem in the heart of the South West. As well as housing Dartmoor, an established Area of Outstanding Natural Beauty, it’s also known for its stunning coastal scenery, both north and south of the county. Whatever Devon wedding venue you choose, whether country or coastal, you are going to be in for a real treat. Luckily, our Devon wedding marquees can provide an extra element of luxury that you may never knew possible. 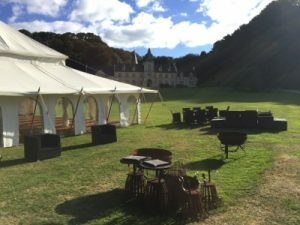 We have constructed marquees on the grounds of beautiful wedding venues in Devon, as well as private land overlooking lakes and rivers to host the reception party. Due to our marquees having optional, open-sided canopies, such as our Savannah marquee package, you and your guests will be able to take advantage of the stunning panoramic views from sunrise to dusk. Regardless of the location, our Devon marquee hire allows you to extend your special day celebrations well into the night, and even the remainder of the weekend! To the West of the Devonshire border is the charming county of Cornwall. From Penzance up to Looe, every part of the rugged landscape offers picturesque views for miles to see. That’s why The Beautiful Tent Company offers exceptional tents for weddings in Cornwall to utilise the gorgeous coastal backdrops. If you choose our India package, you can expect a stylish and chic entertainment space, which is available at your disposal. From fine dining experiences to creating the floor space to throw your best Michael Jackson impressions, the India Tent is the perfect marquee for your Cornwall wedding. 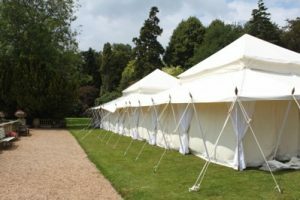 Our South West marquee hire services extend to the diverse county of Somerset. With the Mendip and Quantock Area of Outstanding Natural Beauty, as well as Exmoor National Park, there’s plenty of stunning landscape to hold your Somerset wedding marquee reception! The team at The Beautiful Tent Company will look help to create a bespoke and unique atmosphere within our tremendous and eye-capturing tents, whichever you choose. Take a look at our gallery for just some of our previous South West marquee weddings which we have had the pleasure to attend. Wedding Marquee packages are a fantastic alternative to your more traditional wedding venue reception. They give you the freedom to be as creative and imaginative as you wish, especially with our range of extra options to make your day really stand out. Whether you choose a coastal wedding retreat in Cornwall or a magical countryside location in Devon or Somerset, we are on hand to help you on the most important day of your life. Our local team will be more than happy to discuss your wedding day or private event plans in more detail, so please get in touch with Mark or Glyn who will be able to answer your questions. 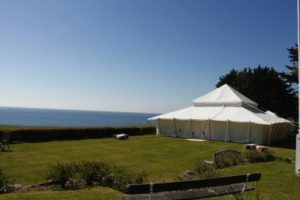 If you are looking for a trusted and local marquee hire company, choose The Beautiful Tent Company for your 2019 wedding, today!